I was talking with a friend the other day about how excited we both are about fall arriving. It didn't take long before the ubiquitous Pumpkin Spice Latte was mentioned. "I really like pumpkin spice lattes," she confessed. "But I don't feel like I should be judged for that." Call me basic, but I totally agree. The truth is, the pumpkin spice latte has reigned as fall's most popular beverage because it's freakin' delicious, and there should be no shame in enjoying it. Besides, who's going to tell you you can't like it? A bunch of white girls on Instagram drinking matcha lattes? Por favor. That said, don't go crazy. Pumpkin spice is delicious in some things, but that does not mean it should be put into all things. Pumpkin Spice salsa, Pumpkin Spice tortilla chips, Pumpkin Spice juice (whatever that is), Pumpkin Spice crackers, Pumpkin Spice "butter spread", Pumpkin Spice peanut butter, Pumpkin Spice beer, Pumpkin Spice soda. Stop it. Without a doubt the greatest of all pumpkin spice treats is the pumpkin spice latte, but not the one from Starbucks which, by the way, is really, really bad for you. A 16oz PSL from Starbucks has 50 grams of sugar (that's 1/4 of a cup! ), 240 milligrams of sodium, 14 grams of total fat (8 of them being saturated fat, 40% of your recommended daily intake according to the label, and that's if you use 2% milk), and over 20 different ingredients, some of them less than natural. Just to avoid the insane amounts of sugar alone I would make this at home. And lucky for us, it's pretty easy to do. All you need is pureed pumpkin and a pumpkin pie spice blend. Now you can use a store bought spice spend but if you want it to be amazing it only takes about 5 minutes to make your own. For this blend I used all spice, pumpkin seeds, cloves, black pepper corns, nutmeg, Mexican cinnamon, and fresh ground ginger. 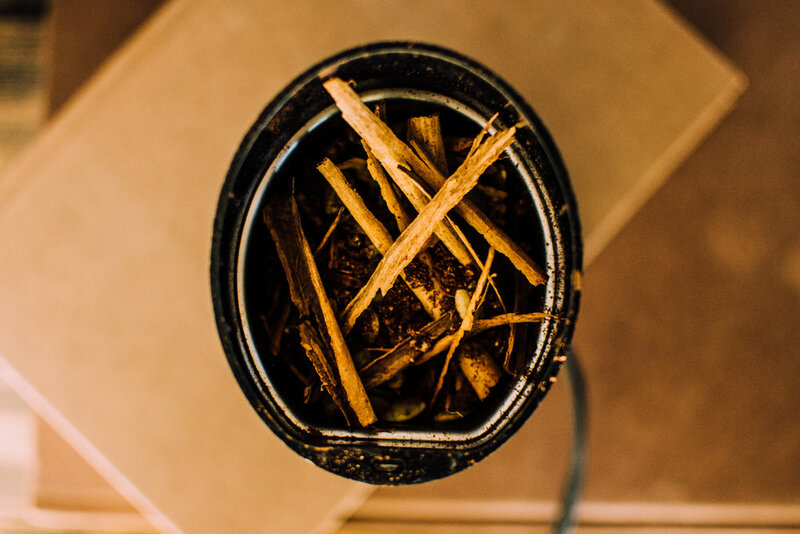 (NOTE: Mexican cinnamon is more like tree bark than a ridged stick and will break down much easier in your spice grinder than other kinds of cinnamon.) Place all your spices in a dry pan and toast on medium low for about a minute, or until fragrant and toasted (be careful not to get them too dark or burn any of the spices). Next put your toasted spices in a spice grinder and and blend until well combined. Next, the coffee. For this to be delicious you just need good coffee, for this to be a latté you need an espresso machine. We'll get into that in another post. If you don't have an espresso machine, don't sweat it, try using a moka pot. It's the closest you will get to espresso without laying down some serious cash. If you don't have one of those, just use your regular coffee maker. Once you have your coffee ready, mix about a tablespoon or so of your spice blend into one can of pumpkin puree and about a two teaspoons of vanilla extract and sauté for a few minutes until slightly darker and most of the squashy taste of the pumpkin is gone. Remember that pumpkin is a vegetable and definitely tastes like one until you doctor it up. Next, blend some of this mixture with your espresso or hot coffee. If you have an espresso machine, steam your milk and your done. If you don't, warm your milk and mix in the blender with the coffee and pumpkin mixture until well combined. Now sit back, relax and enjoy. 1) Place all spices in a dry saucepan and toast on medium-low heat for about 1 minute. Be careful not to let the spices get too dark or burn. 2) Transfer toasted spices to a spice grinder and blend until well combined into a fine, grainy consistency. 3) Return about 2 tablespoons of the spices to the sauce pan with 1 can of pumpkin puree and two teaspoons of vanilla extract. Cook on medium-low until well combined and the pumpkin has lost some of its squashy taste. 4) Combine some of the mixture with two shots of espresso and steamed milk, or blend with fresh brewed coffee and milk in a blender.